Maybe you like a good classic Sinatra tune. Perhaps you prefer to stay in the 80s. 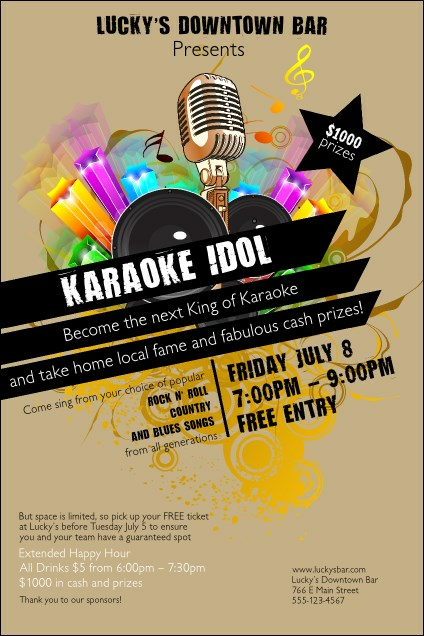 Whatever you rock, promote it with this superfun Karaoke Poster. This template includes 26 lines for your event information, so fans around town will know exactly what's happening. The colorful stars draw the eye to the microphone, reminding everyone what's about to go down. Poster measures appx. 11.46" by 17.18"
Promote your big show with the right poster from TicketPrinting.com.